Arthur Székely (1887–1952) had a remarkable career. In 1908 he was among the founders of the liberal Galilei Circle, of which from 1908 to 1913 he was the chief secretary and later president. He became an acknowledged commercial expert and occupied important economic positions. In 1910-13 he was the secretary of the National Association of Chemical Manufacturers, in 1914-16 secretary and in 1923-44 director of the Center of Hungarian Customs Policy, and in 1916-41 secretary of the Budapest Chamber of Commerce and Industry as well as director of the Department of Foreign Commerce of the same. At the same time he was the general manager of the Center of Customs Policy delegated by the chamber, in 1920-27 director of the Hungarian Association of Commerce and from 1945 commissary chief secretary of the Chamber of Commerce and Industry. This letter of Ady has been hitherto only available in photocopy. 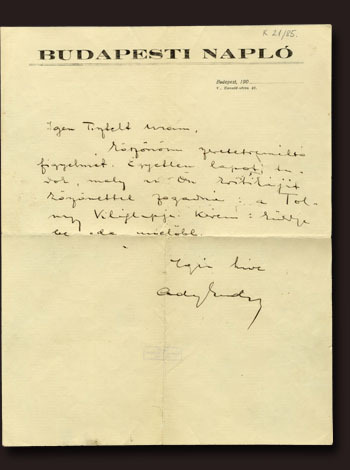 László Vitályos, the doyen of the critical edition of Ady’s works published it on the basis of this copy in the first volume of the correspondence of Endre Ady (1895-1907) 2 The short letter was written in a polite tone, but it is surprising that Ady recommended to Artúr Székely to publish his review in the Tolnai Világlapja (or Tolnay in the spelling of Ady), although this journal did not publish reviews. The article of Artúr Székely was finally published in the journal Világosság. Here below we publish the transcription of the letter on the basis of the original manuscript. In fact, since December 2009 the original of Ady’s letter has also been available. 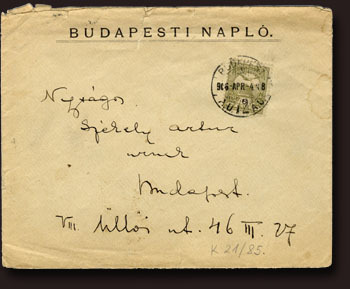 It was then that Eri Székely, daughter-in-law of Artúr Székely donated it to the Manuscript Department of the Library of the Hungarian Academy of Sciences. The letter is conserved in the “K” section reserved for the particularly valuable manuscripts, together with the other documents on Endre Ady, under shelfmark K 21/85. Thank you for your lovable attention. I know about only one journal which would accept your manuscript with gratitude: the Tolnay Világlapja. Please do not hesitate to send it there the soonest possible.